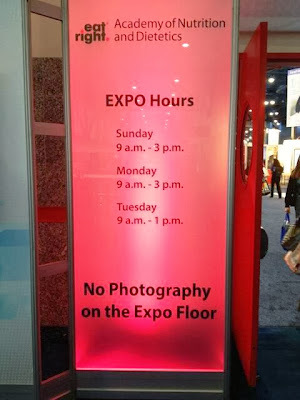 Weighty Matters: The Academy of Nutrition and Dietetics Banned #FNCE Expo Photos?! 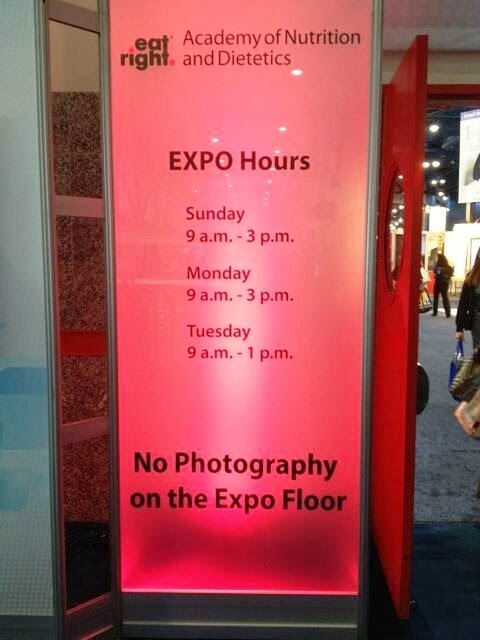 The Academy of Nutrition and Dietetics Banned #FNCE Expo Photos?! This one's too fascinating not to mention. The past few days the Academy of Nutrition and Dietetics (AND) held their massive annual Food and Nutrition Conference and Expo. Now I would have thought that an "exposition", a large public exhibit of art or trade goods, would by definition encourage the dissemination of said public exhibit. Instead AND had a "No Photography on the Expo Floor" policy which according to the photo up above's source, RD Andy Bellatti, was only enforced by Coca-Cola (way to "Come Together" Coca-Cola - nothing says "together" like a photo ban) and PepsiCo. Regardless of whether or not the ban was enforced or who enforced it, I'd say the simple fact that the exposition floor photo ban existed speaks volumes about AND's credibility and transparency as the only reason to have a ban against photos of an exposition is if there was something (or someone) there they (or one or two of their most major sponsors) wanted to hide. If I were a member of AND, I'd be furious, as no doubt the ban looks far worse on them than any pictures ever could.